Overview - It's been said (but unsubstantiated) that Butch Cassidy and the Sundance Kid were killed in a standoff with the Bolivian military in 1908. Cassidy survived, and is quietly living out his years under the name James Blackthorn in a secluded Bolivian village. Tired of his long exile from the US and hoping to see his family again before he dies, Cassidy sets out on the long journey home. But when an unexpected encounter with an ambitious young criminal derails his plans, he is thrust into one last adventure, the likes of which he hasn'’t experienced since his glory days with the Sundance Kid. According to many books and movies, most legendary, mythic characters meet suitably larger-than-life ends. Not content to simply fade away, they often die under dramatic circumstances that mirror how they lived their lives. Even those based on actual historical figures, rarely just pass on peacefully in their sleep, instead favoring a much more elaborate curtain call. After enduring such impossible odds filled with adventure and excitement, it seems only natural that their ends would come with a bang and not a whimper. This is true of infamous bank robber, Butch Cassidy, and as depicted in 'Butch Cassidy and the Sundance Kid,' he and his partner in crime do indeed go out in a blaze of glory. History itself implies a similar violent (though much less sensationalized) death for the duo -- but what if that wasn't actually the case at all? What if Cassidy had survived? What if the notorious criminal lived on secretly into old age, hiding peacefully in a quiet Bolivian village? What if that bang capping off a life full of dangers and thrills was really nothing more than a long prolonged, lingering whimper? Mateo Gil's 'Blackthorn' presents such a scenario, and through its strong performances, lush cinematography, and insightful themes, the slow paced, moody western is able to overcome a few narrative stumbles, leaving audiences with a solid and mostly satisfying experience. Presumed dead in a 1908 skirmish with the military, Butch Cassidy is actually living out his autumnal years under the alias of James Blackthorn (Sam Shepard) in a small Bolivian village. Resigned to an uneventful and peaceful existence, Blackthorn is a far cry from the legendary Robin Hood-esque robber he once was. After receiving sad news from the states, the elder gunslinger decides to end his exile and return home. Unfortunately, a run in with a Spanish thief, Eduardo (Eduardo Noriega), complicates matters, and soon Blackthorn finds himself once again caught in a dangerous but exciting adventure. Inspired by several theories that cast doubt on Cassidy's alleged death, the script is an interesting alternate take on the infamous figure's final days. Most of the picture is slow and contemplative, engendering a somber mood. The story moves between long stretches of quiet conversation, atmospheric, wide shots of Bolivian landscapes, and sporadic bursts of harsh violence. Some flashbacks to Cassidy and Sundance's last adventures together feature a lighter tone, evoking a more old-school western charm that clashes nicely against the lyrical melancholy of the main narrative. While these brief peeks into the past can be fun diversions, they don't carry as much weight or impact in the overarching story as one might hope for, and can at times feel a little extraneous. Likewise, the central plot itself lacks drive for much of the initial running time, and some of the early segments of the film carry a meandering quality. Thankfully, once Blackthorn commits himself to the situation he unwittingly stumbles upon, the movie picks up considerably and finds a nice, steady momentum. By the time the film reaches its uncertain and ambiguous conclusion, Gil and screenwriter Miguel Barros have developed a very interesting western yarn about friendship, betrayal, and justice. As a legend in his twilight years, Sam Shepard carries the picture and his multifaceted performance is a real highlight. Beneath his tired, weathered face and tough guy bravado, lies a genuine heart which fuels some of the film's more interesting moral dilemmas. The uneasy and sometimes humorous alliance that develops between Blackthorn and Eduardo steers the drama and as the pair grow closer it at first seems like Cassidy might have finally found a new Sundance. Matters aren't as simple as they first appear, however, which leads to some interesting third act reveals and reversals that are handled decently by Eduardo Noriega. Stephen Rea also turns in a very solid performance as Mackinley, the man who was once charged with tracking down Cassidy and Sundance. His presence in the movie's later portions adds some nice dimension to the story and serves to connect the flashbacks to the main narrative more firmly. 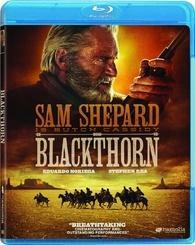 Magnolia brings 'Blackthorn' to Blu-ray on a BD-50 disc housed in a keepcase. Some skippable trailers plays upon startup before transitioning to a standard menu. The packaging indicates that the release is region A compatible. The movie is presented in a 1080p/AVC MPEG-4 transfer in the 2.35:1 aspect ratio. Shot digitally in high definition, the transfer is very strong, showing off the many stunning shooting locations with pleasing dimension. The source is clean with some very light noise visible from time to time. Detail is good, though some shots can look a tad soft. The film features many varied and often impressive landscapes, and the wide screen cinematography can be quite breathtaking at times. The lush jungles, dry desserts, perilous salt flats, and treacherous mountains of Bolivia come through with great clarity and depth. One scene toward the end is particularly impressive, as heavy snow falls from the sky with each tiny snowflake distinct and crystal clear in the image. Whites are intense without blooming and black levels are consistently deep. Colors are rich but slightly muted, though several flashback scenes feature a much more vibrant and cheery palette. Despite a few soft shots here and there, 'Blackthorn' is a very strong looking film, with a great transfer that does its beautiful locations and scenery justice. The film is provided with an English DTS-HD Master Audio 5.1 track with forced English subtitles during its Spanish language portions. Optional English SDH and Spanish subtitles are also included. Though not quite stellar, this is a solid track that offers effective ambiance and a few bursts of excitement. Dialogue is clean and easy to make out with no notable crackles. Though the film can be very quiet and a bit front heavy at times, the soundscape still feels wide and open with appropriate ambient effects. Galloping horses, chirping birds, flowing rivers, and a great original score all fill the speakers with pleasing fidelity. Of course, like most westerns, guns do eventually blaze, and thankfully the track does a good job of delivering each ear-popping shot with a deep thud and bang, bringing some welcomed kick to the low end. Balance between all the elements is fine, with speech never getting lost in the shuffle. Dynamic range is wide with no distortion among a full gamut of frequencies. While not a true standout, the mix is more than serviceable with an artistically and technically proficient presentation. Magnolia offers a small but welcome assortment of supplements, including deleted scenes, some short films from the director, and a making of. All of the special features are presented in high definition with DTS-HD MA 2.0 sound and English subtitles (for the Spanish language portions only). Deleted Scenes (HD, 22 min) - Ten additional scenes are included here and are viewable together with separate chapter breaks. Most of the cut footage amounts to extensions or slightly alternate versions of scenes already in the film. The last excised sequence is a bit more interesting, however, though I'm not really sure how or where it would have fit into the main narrative. Making of Blackthorn (HD, 10 min) – Presented in Spanish, this is a brief but informative look at the film's production that features interviews with the filmmakers and some behind-the-scenes footage. The participants discuss the real-life Butch Cassidy and detail the series of events that inspired the story. Everything from the casting, shooting locations, and visual style are touched upon, providing some decent though not very in depth insights. Short Films by Director Mateo Gil (HD) – Two Spanish language short films from the director are included. The first, 'Breaking and Entering' (17 min), deals with two scam artists who try to trick a woman into forking over her hard earned cash. The second, 'Say Me' (15 min), deals with a man and woman as they argue over the selfish and unrealistic desires of their sexes. Both shorts are well done and while they are completely different stylistically from the main feature, they are still nice inclusions. HDNet: A Look at Blackthorn (HD, 5 min) – This is basically a quick interview with star Sam Shepard interspersed with clips from the movie. Shepard discusses how he got involved with the project and what it was like working with the director and his co-stars. Trailer (HD, 2 min) – The film's trailer is included with DTS-HD MA 5.1 sound. Also from Magnolia Home Entertainment (HD) – Five more trailers are included for other Magnolia releases. 'Blackthorn' is an interesting alternate take on the Butch Cassidy story. Despite a few hiccups here and there, the film succeeds thanks to strong performances, occasionally breathtaking visuals, and an ultimately thoughtful rumination on friendship and morality. The video transfer is very strong and the audio mix is solid. While not loaded with supplements, the included special features are interesting and informative. This might not be a new defining entry into the western genre, but it is definitely worth a look.